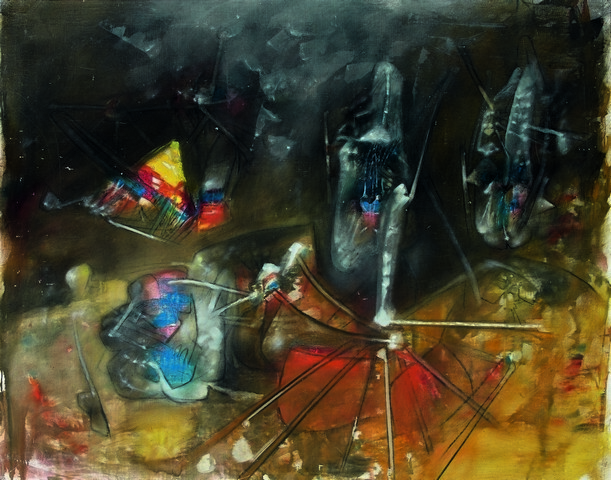 Roberto Antonio Sebastián Matta Echaurren, known as Roberto Matta or Sebastiano Matta (Santiago de Chile, 1911 – Civitavecchia, November 23, 2002), was an architect and painter. After completing his studies in architecture in Chile, in 1934 he moved to Paris where he worked with Le Corbusier and comes into contact with intellectuals such as Rafael Alberti and Federico García Lorca. He knows André Breton and Salvador Dalí and adheres to Surrealism paintings focused on developing psychological morphologies. At the beginning of World War II he flees to New York along with many other avant-garde artists. Here he exerts a decisive influence on some young artists such as Jackson Pollock and Arshile Gorky. In 1949 he moved to Rome and he will become an important link between abstract expressionism and the emerging Italian abstraction. Leaving Rome in 1954, he moved back to Paris, but he maintained a tight relationship with Italy until the end. His works are exhibited in major museums around the world.